One of the most common complications after antireflux surgery is the migration of the fundoplication into the mediastinum , leading to recurrent GERD symptoms. To prevent postoperative intrahoracic wrap herniation, some authors have advocated the closure of the hiatus and the use of prosthetic materials. There is debate over what material should be used. 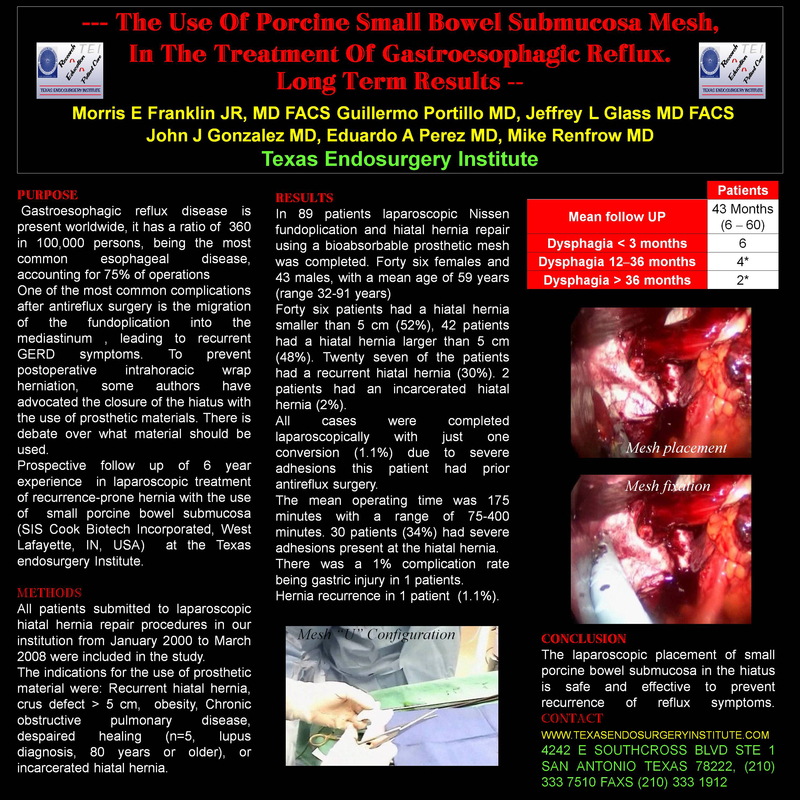 Prospective follow up of 6 year experience in laparoscopic treatment of recurrence-prone hiatal hernia with the use of small porcine bowel submucosa (SIS Cook Biotech Incorporated, West Lafayette, IN, USA) at the Texas endosurgery Institute. All patients submitted to laparoscopic hiatal hernia repair procedures in our institution from January 2000 to December 2008 were included in the study. The indications for the use of prosthetic material were: Recurrent hiatal hernia, crus defect > 5 cm, obesity, Chronic obstructive pulmonary disease, despaired healing (n=5, lupus diagnosis, 80 years or older), or incarcerated hiatal hernia. Fifty-one patients have an hernia smaller than 5 cm (52%), 50 patients had a hiatal hernia larger than 5 cm (48%). 30 of the patients had a recurrent hiatal hernia (30%). 2 patient had an incarcerated hiatal hernia (2%). All cases were completed laparoscopically with just one conversion (1.01%) due to severe adhesions present at the hiatal hernia, this patient had prior antireflux surgery. The mean operating time was 175 minutes with a range of 75-400 minutes. 30 patients (34%) had severe adhesions present at the hiatal hernia. The laparoscopic placement of small porcine bowel submucosa in the hiatus is safe and effective to prevent recurrence of reflux symptoms.